This is a special meeting that will be a hybrid of our regular chapter meeting event, with Karen Dietz, PhD, presenting ONSITE to our on-site Learning Event attendees, as well as to a separate virtual audience. This registration page is for the onsite event. Neuroscience and 100,000 years of human experience show us the power of storytelling to engage others, shift perceptions, and manifest change. This session will give you what you need to know about engaging effective storytelling across the organization. Storytelling’s influence and significance is acknowledged by renowned publications such as: the New York Times, Forbes Magazine, Harvard Business Review, Inc. Magazine, and Fast Company, just to name a few. In today's data-driven distracted world, if you want business results you've got to grab your best material and add heart + soul. Her clients have included Walt Disney Imagineering, NorthFace, Chase Manhattan Bank, Avery Dennison, Thrivent Financial, Veterans Administration, Cincinnati Chamber of Commerce, Just In Time for Foster Youth, and Princess Cruises. 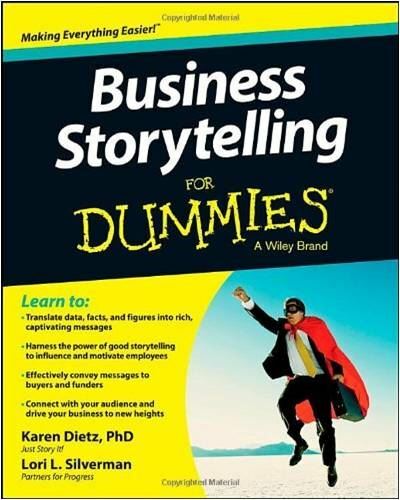 She was recruited to write her deeply rich how-to book Business Storytelling for Dummies. It is full of results-oriented examples and quickly became a bestseller within a year of being released. In addition, Karen (who has also been a TEDx speaker on the subject) has collected the world’s largest free online library of quality material on business storytelling (which she will share with our audience).